Terry Boult heads for the slopes about 50 days each season, and what he carries in his pocket has nothing to do with snowboarding or skiing: his UCCS business cards. “I gave out five business cards yesterday at A-Basin on the chairlift. They’re always in my jacket,” said Boult, a computer science professor in the College of Engineering and Applied Science. Boult chats with strangers, asking where they live and what they do, looking for opportunities for students in the UCCS Bachelor of Innovation, a degree program he founded. Teams pair with businesses for hands-on experience; they may conduct a market analysis for a product and produce a marketing film and a social marketing campaign, for example. 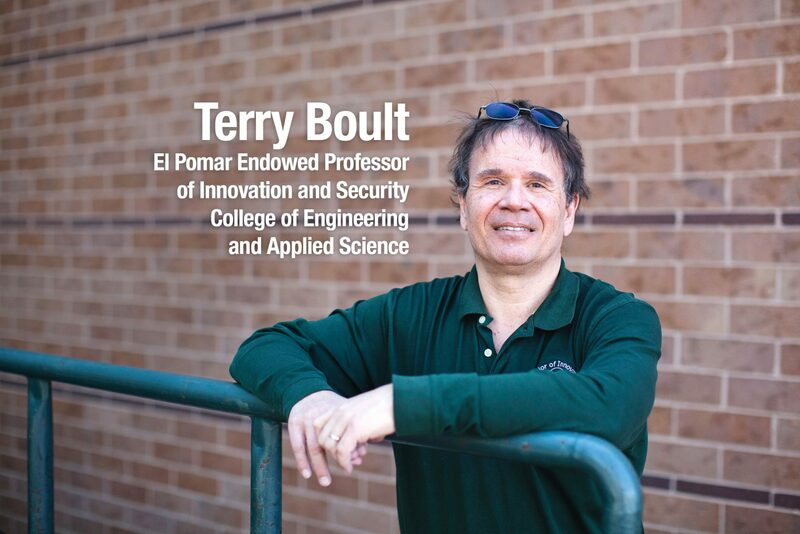 Boult, an El Pomar Endowed Professor of Innovation and Security, uses time on chairlifts to find businesses that could be good matches for students. Boult, 57, knew in sixth grade that he wanted to become a professor when he was a classroom helper, tutoring mostly in math and science. He liked it so much that he helped classmates every year, even throughout college. “I struggled in some ways and felt I could help other people not struggle as much as I did,” he said. As a freshman undergraduate, he was diagnosed with dyslexia, a language-based learning disability. He didn’t share it with professors, didn’t get extra time on exams, didn’t want to be labeled. Now he’s open about it, meeting with students who have a learning disability to share how he copes and to encourage them. 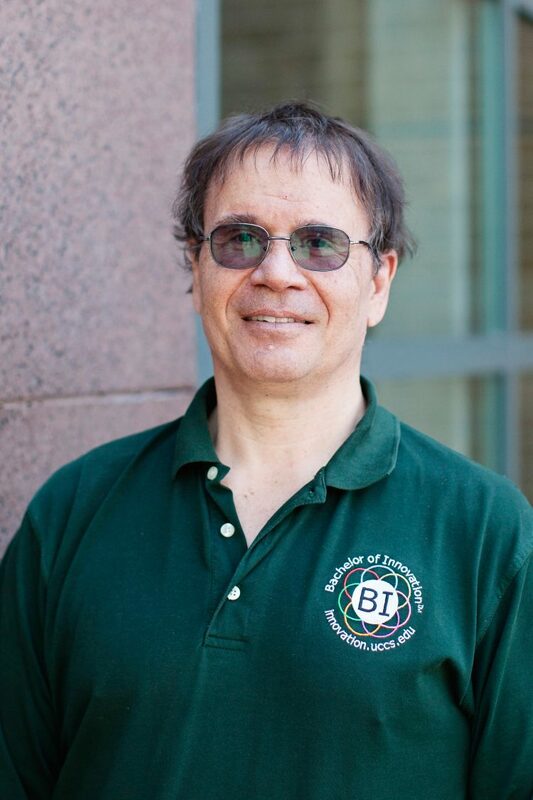 He earned all of his degrees from Columbia University in New York City: a bachelor of science in applied mathematics in 1983, a master of science in 1984, and a Ph.D. in computer science in 1986. His ongoing research projects include advanced biometrics, advanced security systems, and the design and evaluation of statistical machine learning. His work in sensor-based security systems helped develop one of the largest wireless video surveillance systems in the world. Boult was named a 2017 Institute of Electrical and Electronics Engineers Fellow for his contribution to the fields of biometrics and computer vision. He’s published more than 250 papers and has 14 patents, including for security, medical imaging and a game that sparks creativity, with five more pending. Boult believes innovation happens when ideas converge, which is the premise behind him spearheading the Bachelor of Innovation. The program incorporates a core curriculum of innovation courses in addition to the degree requirements for the major. The goal is to equip students with skills such as delivering effective presentations and the ability to work in teams and communicate with people in different fields. A team of early education majors, for example, invented a company where parents pick up a week’s worth of pre-made meals. When students needed help with marketing, they brainstormed with business majors. Nearly 500 students are enrolled in the BI, which celebrates its 10-year anniversary this month because it began in fall 2007. About 220 have graduated from the program. Connor McCormick was a freshman when he took a startup idea to Boult. He and other students wanted to solve the problem of parking with an app that shows where available spots are. Since then, Lot Spot has won national competitions and secured more than $250,000 in funding. McCormick credits their success in large part to Boult. McCormick—who graduated in December with a BI in business administration and cross-core in engineering technology with an emphasis in computer science—is astonished that so close to his hometown of Denver is a degree program invented by someone of Boult’s caliber. Although Boult could retire, he doesn’t have plans to anytime soon. He’s excited about what’s to come: the BI keeps growing, and a Masters of Innovation degree program is in the planning stages. 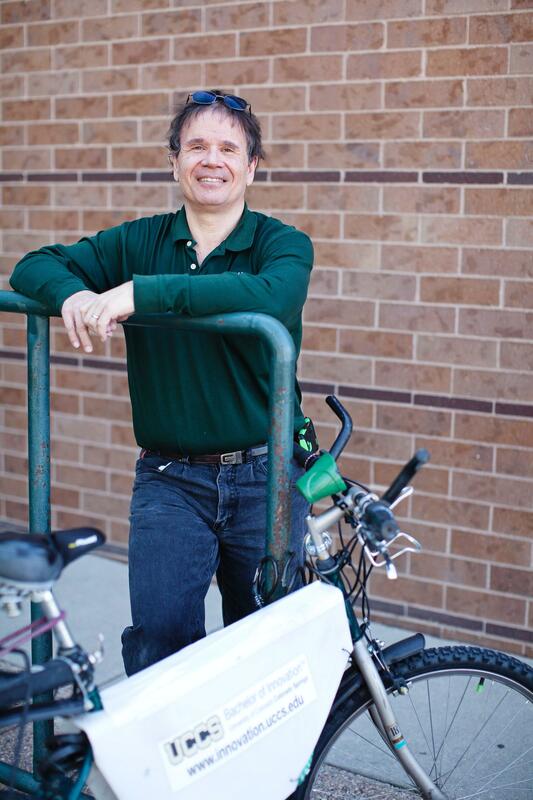 So for now, he’ll keep riding his home-built electric bicycle, which has two large BI decals, about a mile to UCCS. He walks if it’s too snowy or icy.